While a lot of you may argue that veg biryani is basically just pulao, there are places in the city that have veg biryani on their menu, and make it well enough for it to actually be called biryani (& not pulao). For vegetarians who want the the best of both worlds (that is, those who want to eat biryani without having to eat meat) these seven places are perfect for you. Love South Indian? Amma Haus does stellar South Indian style biryani and boy, will you be impressed by the quantity! For the health-conscious, Amma Haus also offers Hauz Brown Rice Biryani, tossed with flavourful spices and crunchy veggies. Their Saffron Veggie Biryani with aromatic spices, seasonal veggies and well, saffron, is another good option. A relatively new entry into the city’s biryani scene (oh, there definitely is one), this delivery-only outlet does decent biryani, and even better vegetarian accompaniments. They’ve really only got one veg option – the Begum’s Hyderabadi Biryani, which is aromatic and goes perfectly well with Sassy Begum’s Saalan and Tamatar Ka Kut. Other than the fact that their curries have a little too much oil in them, there’s not a thing we do not like about Sassy Begum. Nothing’s better than spicy biryani, chatpata raita (to undercut the spicy biryani here) and chilled beer – and you’ve got to love Beeryani for this heavenly combination. While we usually opt for the Murg Handi Biryani here, our vegetarian colleague highly recommends the Paneer Biryani. We also hear great things about the Awadhi-style Subz Dum Handi Biryani. In this list of heavyweight biryani legends, Fab Cafe might seem out of the place, but we have three words for those who think so – Kathal Quinoa Biryani. The biryani here is unlike your usual heavy, spicy and well, calorie-heavy kind. It’s got chewy jackfruit, is super-light, but at the same time, tastes so, so good. Order the Kathal Biryani with one of their refreshing smoothies and you’re good to go. Handiwala’s biryanis are cooked for hours in handis, have the perfect balance of flavours with their authentic masalas, and if you want some good ol’ biryani, these guys do it best. Sabzi Biryani and Paneer Biryani are the only two options they’ve got – but they do it well enough to make up for the lack of options. The sad part? They only deliver in Noida and areas around it. One of the few places in town that offers enough veg biryani options (and does a great job with them), Biryani Blues has slowly become our go-to for when we’re craving the good ol’ heavy, spicy biryani. For vegetarians, they’ve got the Classic Vegetable Biryani, the Paneer Biryani and a separate veg handi biryani too. If we were you, we’d opt for their ‘Veg Meal For One’ that comes with a veg biryani, a starter (paneer), mirchi ka saalan and curd – for only INR 250 per head. They’ve got only two options when it comes to veg biryani – Hyderabadi Veg Biryani and Lucknowi Veg Biryani – both of which they do fantastically. 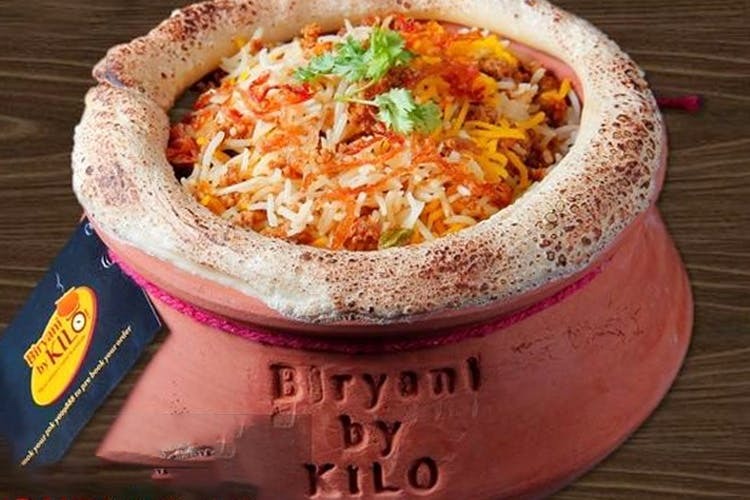 Piping hot, flavourful biryani delivered the old-school way in earthen matkas is what a vegetarian’s biryani dreams are made of. Party or no party, diet or no diet, be sure to end the Biryani By Kilo meal with their sweet, sweet phirni.